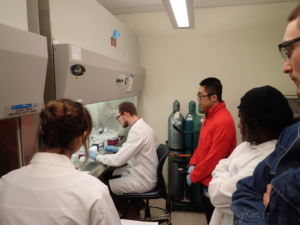 Brandon LaBumbard teaches qPCR at the Woodhams lab. Brandon LaBumbard will be attending the JMIH: Joint Meeting of Ichthyologists and Herpetologists from July 6-10 in New Orleans and presenting on “Inhibition of pathogenic fungi using volatile organic compounds produced by bacteria” with funding from the UMass Boston Lipke travel award. Lindsey Raymond was accepted into the Scientific Communication for Undergraduates course sponsored by the NIH’s National Research Mentoring Network and will present her research on May 5. Dr. Andreas Hertz returned from his research trip to Panama studying “Amphibian Mucosal Defenses against an Emerging Fungal Disease: testing for Selection in Recovering populations,” supported by the UMass Boston Office of Global Programs.